In the fast-paced world of retail, network reliability is everything—but so are security, agility, and cost-effectiveness. Retailers want it all, and they depend on their IT administrators to balance these needs. 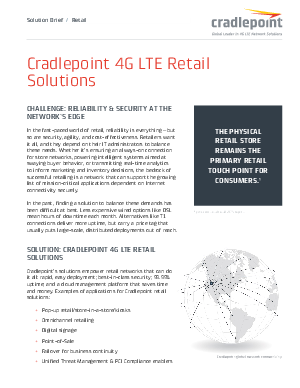 Whether it’s ensuring an always-on connection for store networks, powering intelligent systems aimed at swaying buyer behavior, or transmitting real-time analytics to inform marketing and inventory decisions, the bedrock of successful retailing is a network that can support the growing list of mission-critical applications dependent on secure Internet connectivity. In the past, finding a solution to balance these demands has been difficult at best. Less expensive wired options like DSL mean hours of downtime each month. Alternatives like T1 connections deliver more uptime but carry a price tag that usually puts large-scale distributed deployments out of reach.